Kids will appreciate attractions like Australian National Maritime Museum and Dolphin & Whale Watching. 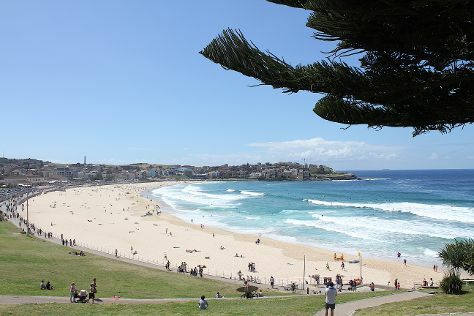 Visit Bondi Beach and Manly Beach for some beach relaxation. The adventure continues: wander the streets of The Rocks, see the interesting displays at Hyde Park Barracks Museum, contemplate the long history of Justice & Police Museum, and engage your brain at Powerhouse Museum. To find ratings, other places to visit, traveler tips, and tourist information, you can read our Sydney driving holiday planner. Amsterdam, The Netherlands to Sydney is an approximately 25-hour flight. You can also do a combination of train and flight; or do a combination of flight and train. Traveling from Amsterdam to Sydney, you'll lose 9 hours due to the time zone difference. Plan for a bit cooler temperatures traveling from Amsterdam in July, with highs in Sydney at 21°C and lows at 9°C. Wrap up your sightseeing on the 8th (Thu) early enough to drive to Katoomba. Do some cultural sightseeing at Norman Lindsay Gallery & Museum and Megalong Creek Estate. You'll explore and learn at Valley Heights Locomotive Depot Heritage Museum and Squirrel Shop. Change things up with these side-trips from Katoomba: Hartley Historic Site (in Hartley), Hartley Historic Village (in Little Hartley) and Dryridge Estate (in Megalong Valley). There's lots more to do: trek along Coachwood Glen Nature Trail, take in the dramatic scenery at Wentworth Falls, explore the fascinating underground world of Jenolan Caves, and take a stroll through Street Art Walk - by Street Art Murals Australia. To find other places to visit, more things to do, ratings, and tourist information, refer to the Katoomba trip maker tool . Drive from Sydney to Katoomba in 1.5 hours. Alternatively, you can take a train. Traveling from Sydney in August, expect a bit cooler with lows of 5°C in Katoomba. Finish your sightseeing early on the 13th (Tue) to allow enough time to travel to Wisemans Ferry. Museum-lovers will appreciate Hawkesbury Regional Museum and Hawkesbury Regional Gallery. You'll visit kid-friendly attractions like The Crommelin Native Arboretum and Palm Beach. Change things up with these side-trips from Wisemans Ferry: Lynwood Country Club (in Pitt Town), Rouse Hill House & Farm (in Rouse Hill) and Fagan Park (in Dural). To find ratings, photos, traveler tips, and tourist information, go to the Wisemans Ferry road trip planner . Getting from Katoomba to Wisemans Ferry by car takes about 2 hours. Expect a daytime high around 22°C in August, and nighttime lows around 5°C. Finish your sightseeing early on the 17th (Sat) to allow enough time to travel to Pokolbin. Start off your visit on the 18th (Sun): learn about winemaking at Ivanhoe Wines, stroll through Hunter Valley Zoo, learn about winemaking at Peterson House, then learn about winemaking at Scarborough Wine Co, and finally do a tasting at Glandore Estate Wines. Get ready for a full day of sightseeing on the next day: look for all kinds of wild species at Morisset Picnic Area, then tour the pleasant surroundings at Caves Beach, and then do a tasting at First Creek Wines & Winemaking Services. For reviews, other places to visit, and more tourist information, read our Pokolbin road trip planner. Getting from Wisemans Ferry to Pokolbin by car takes about 2.5 hours. In August, daytime highs in Pokolbin are 22°C, while nighttime lows are 7°C. Wrap up your sightseeing on the 19th (Mon) to allow time to drive to Nelson Bay. Nelson Bay is a suburb of the Port Stephens local government area in the Hunter Region of New South Wales, Australia. Kick off your visit on the 20th (Tue): look for all kinds of wild species at Tomaree Head, then examine the collection at Port Stephens Shell Museum, then make a trip to Gan Gan Lookout, and finally visit a coastal fixture at Nelson Head Heritage Lighthouse and Reserve. Get ready for a full day of sightseeing on the next day: look for gifts at Vomo the store, identify plant and animal life at Wildlife Areas, then see the interesting displays at Fighter World, and finally indulge your thirst for a good beer at Murray's Craft Brewing Co.
To see ratings, other places to visit, photos, and tourist information, go to the Nelson Bay trip maker site . You can drive from Pokolbin to Nelson Bay in 1.5 hours. Alternatively, you can take a bus; or do a combination of train and bus. August in Nelson Bay sees daily highs of 22°C and lows of 7°C at night. Cap off your sightseeing on the 21st (Wed) early enough to travel to Brisbane. Queensland Museum & Sciencentre and Gallery of Modern Art will appeal to museum buffs. Satisfy your inner culture vulture at Queensland Art Gallery and Ripley's Believe It Or Not! Surfers Paradise. You'll find plenty of places to visit near Brisbane: Sea World Theme Park (in Main Beach), Pelican Feeding (in Labrador) and Surfers Paradise Beach (in Surfers Paradise). There's lots more to do: identify plant and animal life at Lone Pine Koala Sanctuary, see the interesting displays at Museum of Brisbane, take in the spiritual surroundings of Chenrezig Institute, and view the masterpieces at Atrium Gallery at Buderim Craft Cottage. For traveler tips, where to stay, ratings, and more tourist information, go to the Brisbane trip tool . Fly from Nelson Bay to Brisbane in 4.5 hours. Alternatively, you can do a combination of flight and bus; or drive. Traveling from Nelson Bay in August, expect somewhat warmer with lows of 11°C in Brisbane. Wrap up your sightseeing on the 26th (Mon) early enough to travel back home.